It’s Ultimate Shadow King time! 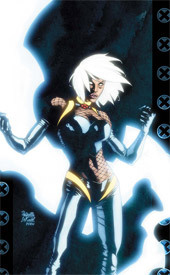 Storm’s been having vivid dreams of late, which have captured enough of her imagination to inspire her to begin programming them into the team’s Danger Room simulations. But when the dreams chase her from the subconscious realm and begin invading her mind while she’s awake, the team starts to take notice. Author Robert Kirkman is taking these characters to a place I’d rather he didn’t. This issue is so convoluted, so full of revisionist history and needless elaboration that I actually began counting the pages until it was finished. This month’s chapter has not one, but two battles with giant, repulsive, lumpy monsters with deep ties to major characters who had coincidentally forgotten all about them up until the moment they met. The supporting cast comes and goes at random, often giving every indication that they intend to help out, but then mysteriously vanishing when the action grows heated. I don’t know how many ways I can say it: this is just a genuinely awful example of writing. Poor dialogue, zero understanding of the characters, a villain so stereotypical that he’s nearly cloned before the end of the issue… the list just goes on. As an artist, Salvador Larroca has had far better days. When I followed his work with Warren Ellis on New Universal, I found that the pedestrian qualities he gave to the lead characters worked perfectly with the story Ellis was putting together. He explored the effects that the sudden acquisition of intergalactic powers would have on an everyman, and Larroca’s work served to further humanize those otherwise-normal individuals. On Ultimate X-Men, though, he brings that same approach and it fails miserably. He wasn’t asked to bring any enormous, power-enhanced fist fights to his previous work, and now I can see why. When the writer imagines an impressive display of mutant abilities unleashed, Larroca delivers an underwhelming, oddly-positioned layout that draws more attention to the meager environment containing the action than the mutants participating. His work looks terribly rushed, his characters inconsistent and unfamiliar. Storm looks like she’s been punched in the face a few times, and the Beast must be a poster boy for HGH because while he was big in the past, he was never this ridiculously muscular. Not only that, but the visual originalities that set the Ultimate squad apart from their 616 counterparts have been almost completely eradicated. There’s nothing that, at a glance, would clue me in that this Wolverine is any different from the one I see every month in New Avengers. He’s a short, stocky, hairy old war veteran again, not the youthful warrior with questionable allegiances that he was when the series began. That’s a shame, too, because if there’s one thing the world doesn’t need right now, it’s another incomprehensible continuity of X-Men with nothing to set them apart from their peers. That last sentence really says it all. Ultimate X-Men was once counted among my favorite books, since it was initially bucking against each of the trends that had handicapped the main continuity X-books. It was a fresh take on characters that I’d enjoyed in the past, a clean slate, a chance to do it all over again and get it right. It’s maddening that the series has spiraled downward to the point that it’s repeating the mistakes of its forefathers before it’s even reached its one hundredth issue. This is terrible. Skip it at all costs.